I seem to have misplaced my breed standard guidelines but thought it would be fun to display this little image from the recent Deerhound Breedshow Parade of Champions. If we look closely, it’s apparent that all on display are quite different - the coat colours, the posture, girth of chest and loin. Some may be more athletic than others and I wonder how many could run down a deer under their own steam, or sleep out in a misty highland glen of a spring evening. Then there’s the temperament, are they all blessed with the good old Scottish traits for hospitality, dignity and strength and still capable of retaining humility and compassion. Unfortunately photographs do not capture all these elements . . . or should that be fortunately? . . . as some have bad habits, some quiet - others noisy, we have the cheeky wee chaps as well as the polite but these are all things that make up the wonder of the breed show. Now, if I could only find their breed standards guidelines sheet, . . . ahh! But enough talk of the human types for now. I will say this, that as usual, the hounds at the show did look good. Oh! and don’t forget to enjoy the Festival of Bealltainn! Whilst attending the Deerhound Breed Show this year, quite a few deerhound people enquired after certain dress attire worn by one of the Rogues Clan in attendance at the show. 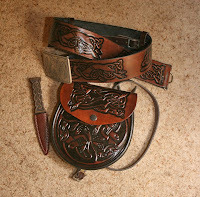 These items were, the sporran and belt worn with the kilt. See the images below to closer inspect the said Scottish National Dress items of which we speak. 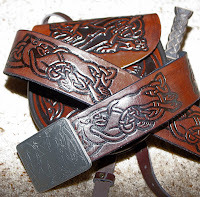 Well, a few years back when looking for a new sporran to wear with his Brodie Weathered Hunting Tartan Kilt oor ‘Chief’ decided to have a sporran and sword belt hand tooled by the finest craftsmen around Loch Lomond. The result causing quite a stir at functions for it’s unique appearance and Celtic Hound appreciating statement. The National Park, Balmaha, Scotland and they post worldwide. Follow the Links and of course, don’t forget to tell them Rogue sent you. Here is some footage from the Deerhound Breed Show at Dunblane Hydro Hotel in Perthshire, Scotland. These highlights were filmed on Saturday 18 and Sunday 19 April, 2009. We didn’t capture enough video unfortunately, having spent most of our ringside time capturing the event as digital still photography for The Deerhound Club. 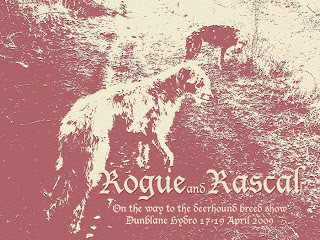 Near on one thousand images were generated and will be featured in the Deerhound Club UK newsletter, on their website and a couple here on our blog just for the Rogue of it! Check them out, as there will be photographs exclusive to each of the aforementioned. In the meantime, enjoy the video below . . . and if you were at Dunblane attending this show, you may spot yourself in the video - keep those eyes peeled. 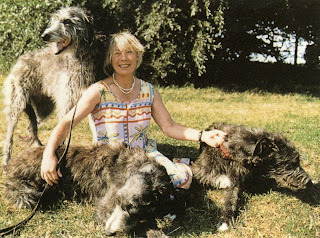 Looking through some old digital files today, we found this photograph captured over twenty years ago, featuring Brodie the first deerhound of the house. 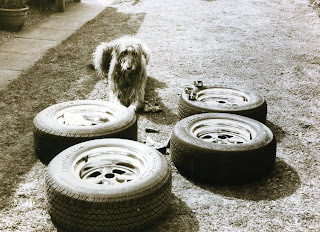 I think this was preparation for a set of supersize deerhound rollerskates which Brodie was overseeing the maintenance to, or it may just have been a cleaning of our 1969 SS/RS 396 Camaro’s wheels in preparation for a show and shine on the day back in the enjoyable eighties. Whatever it be . . . 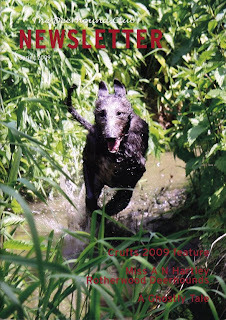 Roll on all Deerhounds! 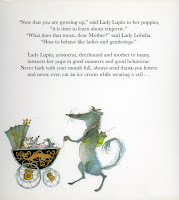 What better a method of learning etiquette, than from the noble deerhound and Lady of Castle Longtail near Lochbone. Lady Lupin’s book will have them little Lord and Lady hounds whipped into shape faster than a change of weather in a highland glen. 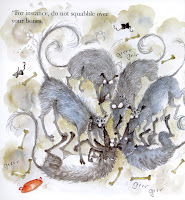 A well illustrated guide to etiquette for all the household and not just the hounds. I actually laughed aloud when I read this little gem and I highly recommend it to all. 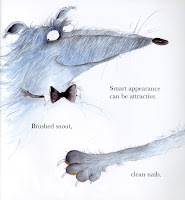 Written and illustrated by Babette Cole this book is a joy, although, unfortunately out of print. 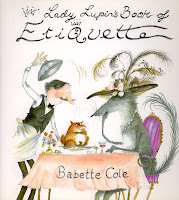 If you don’t own a copy and desire one, I’m sure if you forage about on the marvelous inter-web and search using Babette Cole, Lady Lupin’s Book of Etiquette or ISBN 0-241-14096-X in your search criteria, you’ll unearth a copy. Or perhaps if you follow the above link and pester Babette, she may seek or encourage a re-print. Oh! and let her know that the Rogue sent you. Is your hound fun enough to run enough ? This Sunday 5 April at Rumbling Bridge from 11.00 am, we have an open invitation for Deerhound and Sighthound coursing - come along.